Because the mountain stands alone – it is 1,000 feet taller than any mountain within 30 or so miles – it can be windy, even on a hot day, and weather can change abruptly. No matter which trail you choose, the rocky top can be treacherous when wet, and fog can descend quickly to make finding the trail almost impossible. Remember that this is a very popular climb and easy to reach from Boston, so don’t expect to be alone at the summit on a nice day. 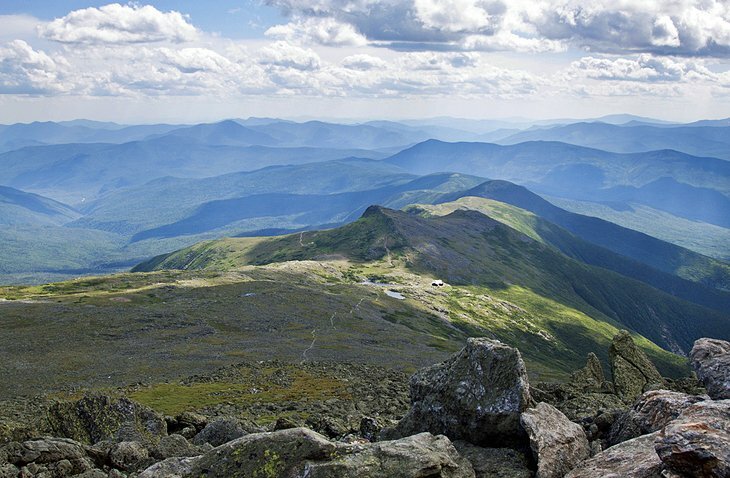 One of the most rewarding trails in the Presidential Range, the ascent of the Northeast’s highest peak alongside the Ammonoosuc River reveals a series of waterfalls, cascades, and views that rival any other route up the mountain. It’s about nine miles round-trip to the summit from the trailhead, which is just below the Base Station of the Mt. Washington Cog Railway, and a full day’s hike. Below the summit, you’ll pass Lakes of the Clouds and the AMC hut. You can return to the trailhead by the Jewell Trail, a much easier descent and with beautiful scenery of its own. Whatever the weather at the base, remember that it is never warm at the summit; Mt. Washington’s weather is so severe that Arctic equipment is tested here, and it’s where the world’s highest land wind velocity was recorded. Weather can change in an instant, and when clouds settle over the summit, visibility grinds to zero.